Creative Hub Making was a landmark gathering of Creative Hubs across Vietnam, bringing together ideas for lasting networks. Can you share a little of your role as facilitators at the event? Shelagh: Peter and I have done a lot of work in the past with the British Council supporting creative hub makers. We’ve been working with the passionate belief that if we’re going to grow the Creative Economy properly then we need this bit of infrastructure that knows how to support and nurture emerging talents in places and spaces that are often quite isolated. It was a privilege to work with the group in Vietnam, who were so full of energy, belief and optimism. We helped to curate the UK input and assess the needs of the creative hub makers as an active response to the Vietnam Creative Hubs Mapping report. The team of people assembled from the UK were able to respond to the practical needs of the hubs in Vietnam by sharing their varied development experience. Peter: It seems in this century, many of the solutions to our most pressing concerns have got to come from the bottom up rather than the top down. Globally we are witnessing a new wave of energy and a passionate belief in building from the ground up. Though this a tough challenge, given that top down systems sometimes struggle to support, and can even get in the way. Getting 40-plus positive young people together was powerful as they could see in each other opportunities to make significant collaborations to support their own development and growth. It was really important to us that “Team UK” wasn’t “Team London”, and consequently our creative players included Delphine Dallison from MAKLab in Glasgow, Donna Holford-Lovell from Fleet Collective in Dundee and Adam Molyneux-Berry half-British and based in Cairo with iceHubs. This underlined the message that not everything of value originates in capital cities. The event programme aimed to share practical skills among attending Vietnamese Creative Hub members. Can you share some examples of these shared skills? Shelagh: Overall, the workshops created practical advice and conversations around what works to meet the needs of creative hubs in Vietnam. The group as a whole was divided into four smaller groups. One of the most significant and powerful parts of the programme was the session looking at sustainable business models and revenue streams led by Adam, which used content that came out of the work we did last year with Hub in a Box. This is often the most fundamentally important question for creative hubs: how to support their sustainability. Another of the event workshops involved community building and membership development, which was led by Donna, sharing knowledge of how to develop and grow their communities and extend their wider set of relationships with local government, partners and each other. Delphine led a group which focused on hubs’ potential in digital development and maker relationships, thinking about the relationships that already exist within and between hub memberships to enable supply chain and making possibilities. What was your impression of the event venue, ADC Academy, as an indicator of how Creative Hubs in Ho Chi Minh City work to bring people and creativity together? Peter: From the start, we loved it. The venue has only been going for two years but it has already outgrown the demand and is looking for new premises. The first thing the Founder of ADC Academy, Ta Minh Tra, said was, “This is not a workspace, it’s a home.” And that sense of home, you really do feel it. Everyone took their shoes off, as you would do at home, and that set the tone in the informal atmosphere for the whole event. Shelagh: ADC Academy runs a successful semi-international studio where the profits are placed back into the hub, now wanting to capture investment to become an incubator for independent creative enterprises. It was seriously much more than a venue, they were great hosts and partners. Creative Hub Making hosted attendees from Malaysia. From your insights, is there potential for a similar network of Hubs there? Shelagh: Yes, very definitely. Grey Yeoh, Head of Arts and Creative Industries in Malaysia for British Council went away incredibly energised. And Katelijn Verstraete, British Council Regional Arts Director in East Asia has contacted us to say work has already started to on the mapping process and that they aim follow the trajectory the Vietnam process has come through. With this is the potential for an East Asia regional programme. Quite a number of people said that inevitably the examples of creative hubs in the UK and Europe, while they are useful and inspiring, in a regional context you are far more likely to look at an example from a neighbouring country—as their context is more likely to be similar to yours with the potential to be able to share more. Overall, what was your biggest learning taken from the Creative Hub Making in Vietnam event? Peter: There isn’t the public funding support that you might access in the UK and in Europe. And yet, the Vietnamese people at the event were on fire. They are incredibly inventive in trying to forge futures that are about community, and not themselves individually, through whatever means they can do this. In the context of contrasting the UK and Europe, that is really inspiring. Clearly it is become increasingly difficult in the UK with the cuts in funding, but any lack of funding over there hasn’t stopped them from forging new futures. We have a lot to learn from the Vietnamese. Another thing for me was that majority of the room were women, which was very refreshing in the context of the sometimes male dominated nature of co-working hubs around the world. And that these women were really powerful in forging their own and their society’s futures. Shelagh: There is an incredible appetite for collaboration. The understanding is that by doing things together in Vietnam, they are much more powerful as they share and collaborate, therefore creating real value. In some of the work we’ve done, say in the Middle East and North Africa, some people tend to be a little bit more competitive and find it difficult to see the advantages of collective action. A lot of the actions that came out of the workshops in Vietnam, people have taken on themselves. They are now setting up Facebook groups, looking at combined programme calendars and a number of other practical things, particular to their needs. We had representatives from the Vietnamese Culture Ministry, who are in the process of putting together their Creative Economy strategy. Discussions at the start of the event prompted them to add the supporting of creative hubs into the government strategy that will be put forward to the Prime Minister in the next few months. We were very heartened by that. There were two brilliant young women who had found out about the event and had been banging on the door to say “can we come.” They were both interested in setting up a social enterprise hub, and had been supported by British Council Education and Society programmes. They got news of the event even though they hadn’t been invited, but they were entrepreneurial enough to beg to come and having learned so much from the event, they left saying they knew exactly what they were going to do in the future. 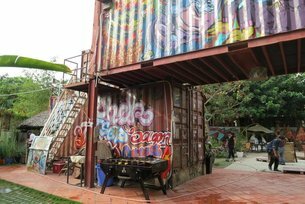 Creative Hub Making in Ho Chi Minh City was funded by British Council and partnered by ADC Academy, open.co and CafeBiz.